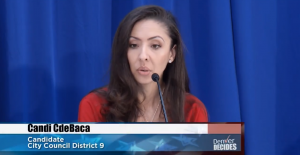 Candi CdeBaca makes no bones about it in her race for the Denver City Council — capitalism exploits the worker while communism is cool. We were not aware of this, but according to CdeBaca, capitalism is in its late phase because it doesn’t work and will soon be a relic of the past. And that’s because capitalist individuals exploit other people by paying them money to work, when it should be done by “the community,” CdeBaca explains without a hint of irony. She insists that only the “community” can own land, resources, and apparently the labor force, and therefore community is the only power that should distribute those resources. You know, communism. She’s clearly serious about her beliefs, and her threat to “usher it in by any means necessary” should be taken seriously by Denver voters.